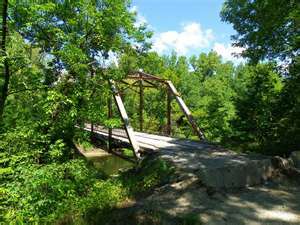 I have read stories of this old bridge called enoch knob bridge. To get there just take I-44 to the washington exit to highway 100 and take the highway all the way to the 185 juntion and make a left. Enoch Knob rd is about a quater mile down the road on the right. 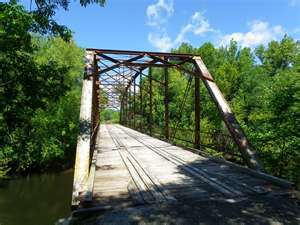 Story has it that back in the early 1900's they used to hang escaped slaves from underneath the bridge, also a little boy has fell through the bridge and drowned in the water below. The hole that the boy fell through is now covered by a metal plate. Urban legend has it that late at night you can see the boy swimming down the river or see his body floating down the river at night. 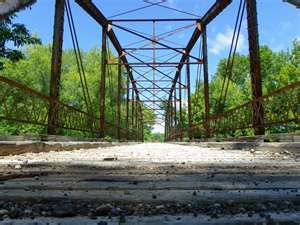 There is also another urban legend that a boy had died accidently while drinking and taking pain killers from a broken hip, by climbing on the bridge and falling to the rocks below. Another urban legend is that you can hear growls and barks of dogs and if you honk your horn three times or chant "demon dog" three times a black three legged with glowing red eyes will appear. This is where my story begins. Just tonight I tried for myself to make this "demon dog" appear. I honked my horn and nothing and chanted "demon dog" three times and nothing. Unsattisfied from the results me and my girlfriend left. We decided we wasnt ready to head back yet so we went to a landing which is a boat ramp access to the same river that runs underneath the bridge. The area is a big open circle with a gravel road that leads to it surrounded by woods and a grass island in the middle with a bathroom. The area is in the middle of no where. So i started to drive around the circle drive and about half way around the circle I started to hear the rattle of chains. The noise was following my truck. Trying to figure out what the noise was I came to a stop and parked. The noise got louder and ended up beside my truck. I look outside my window and down and see a black dog! I didnt take any time to see if it had three legs or red glowing eyes. As soon as I seen it I was gone. I sped to the exit spun my truck around and shined my headlights where I was parked. The dog or what ever the hell it was, was gone. We left and I dropped my girlfriend off and headed back home. On the way I went back to the area just to see if maybe it might have been a stray dog. When I arrived to the area I drove around to find the dog didnt find anything. As I was driving around it, I started to hear the chain rattling noise again. I looked around but no dog. Just the noise. Then the noise was all around me in the woods. I left and havent went back since, and dont plan too. I've lived on this road for over 20 years, spent entire nights on that bridge in the dark, never seen anything. I've heard some crazy made up stories 99% aren't true. People have died down there...mainly because teenagers are stupid. The dog story is a complete crock. The 3 legged dog that has been seen is probably the 3 legged black lab that belongs to the man that lives just down the creek. I also have had many dogs that have roamed down there on a daily basis. Don't believe that ghost story crap. I have heard about animal sacrafices at Enochs Bridge. When my friends and I went to see the bridge, there was a dead deer, half gutted laying by the bridge, very spooky. Also heard that if you take pictures, things such as mist, orbs, etc. will show up in them. We took pics and yes, there were orbs in most of them and a funny mist around my friends head in another. (I have moved and can't find the pics now). Now, before you think we are just more crazy kids......NO, I am 50 yrs old and my friends were in their 40's when we went to the bridge a few years ago.